A subway system can tell marvels about its city, be it good or bad. In New York’s case, it could not be worse. New Yorkers have long viewed their subway system with pride, comparing it to other less elaborate systems in nearby cities, such as Boston and Washington, DC. Fast forward to today, and the MTA’s pride and joy has lapsed into complete disarray. On-time rates have reached an all-time low of 65 percent, similar to the 1970s, and nowhere near the MTA’s projected aim of 91.9 percent. Even as the MTA’s so-called “rescue plan” (aka Fastrack) is attempting to improve the situation, on-time rates still remain depressingly low. Delays are not the only worries, given the unsanitary conditions of the trains. According to a report by Travelmath, a website that calculates travel statistics, the average handrail of a New York subway train contains two million CFU (colony forming units) of bacteria, more than five thousand times that of the second dirtiest subway in the country, the Bay Area Rapid Transit of San Francisco. Problems are evident in the languishing infrastructure as well, with flooding being a major pain for as long as the subway has been running. Most recently, last month’s heavy storms devastated the C and E lines. New York riders took the the time to shoot images of rainwater cascading down the stairs and into the platforms and tracks; some of the video appeared on local newscasts. Likewise, the New York subway has a list of problems longer than a spoiled child’s Christmas list, and the list keeps growing as these problems remain unresolved. The Fastrack plan claims to be making progress, but apart from partial service stoppage on certain lines — such as the 23rd Street station on the F and M lines, as well as the L line — there’s little to show that change is actually being made. Yes, on weekends some platforms are completely roped off for maintenance, but at what cost? Is it worth disrupting the journeys of so many people for changes that are so intangible? Recently, tourists had little choice but to take the C train all the way up to 125th Street and take a downtown train forty blocks back if they wanted to go to the American Museum of Natural History by subway due to trains skipping certain stations. This is only one example of countless others that involve maintenance at the cost of travelers’ time and effort. There is a solution that could put the MTA’s rescue plan in full throttle: giving up the system’s trademark 24/7 service. Few metro systems in the world operate on a 24/7 basis (chart), with New York’s immense ridership proving to be a justifying factor. 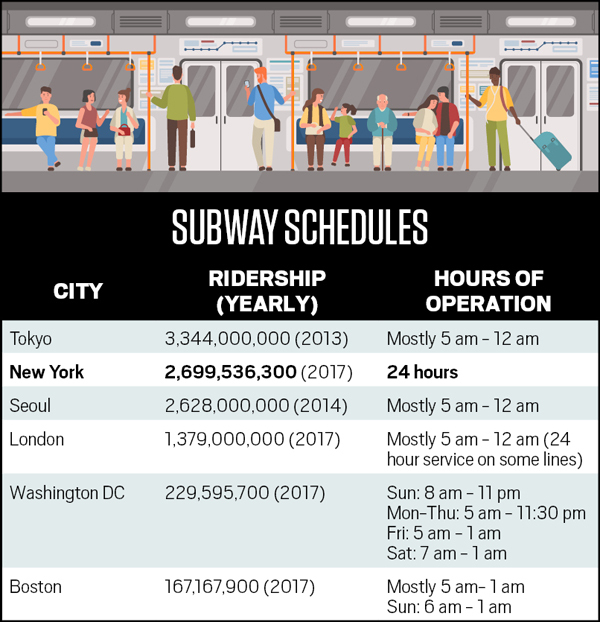 However, there are other subway systems around the globe that have riderships similar to or larger than New York, such as Seoul and Tokyo, yet choose to maintain a “resting period” during night hours for sanitation work and repairs. Put simply, maintenance improvements cannot take place when trains are running day and night. Twenty-four hour service puts unnecessary pressure on improvements that are meant to be meticulous. Is it that much of a loss to simply stop the network for a few hours every night, when riderships are at their lowest? Everyone needs a breather, so why not give the subway one? Of course, it would be admittedly hard to shut down the 24-hour service on such short notice. The subway has been a crucial part of getting people where they need to go at any hour day or night, and that will always be the case. However, the fact remains that Seoul, another city with a bustling crowd when the sun is down, has taken a drastic step in maintaining that midnight break in order to keep its system up and running as needed. Other cities, such as Munich, do not have as long a break in between running hours, but still give their network a much-needed breather. The result is a system that is reliable, efficient and clean. Sacrifice may be necessary to bring about drastic changes. In order to actually see the MTA go forward in terms of improvements, installing a night break would be a difficult, yet healthy pill to swallow. Shutting down the 24-hour service, at least on some lines, is a more tangible idea than one may think. As a part of his “Fast Forward” initiative to make sweeping changes to the city’s transit systems, New York City Transit president Andy Byford has proposed closing subway lines for hours at night while making signal upgrades, though that is a temporary measure. Imagine walking into a New York subway station and not getting bombarded by pungent odors and visually unappealing platforms. Imagine the trains being clean and on time, not changing routes every couple of days. All of that could become a reality if New Yorkers are just ready to accept that slight turn of events. The future of the New York subway system may be one that no one could dare to think of now. Yet it may not be as unachievable as expected, as long as the city is willing to give that difficult pill a chance.